Twelve alums of the Cadets, Phantom Regiment, Santa Clara Vanguard, Madison Scouts and Glassmen, who are regular members of the Detroit Pistons drum line, will "drum against" the members of the Dallas Mavericks drum line, also made up of DCI alums, as part of the NBA All-Star game beginning at 7:30 p.m. Sunday night, Feb. 19. 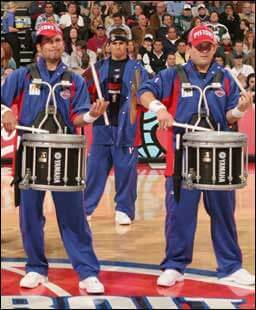 The Detroit Pistons drum line. The game will air on the TNT network -- check you local listings for time and station. Each group will drum for several 20-second intervals. At the end of the "drumoff," the audience will decide which group has given the best performance, according to Todd Ohme, who heads up the Detroit Pistons drum line. Ohme is a tenor drum player who won the 1998 I & E championship (as a member of the Glassmen) and later taught the Crossmen. Both drum lines' performances at the game will include performances with the "Jam Skaters" roller skating group and a 6-year-old drumming prodigy, Ohme says. Ohme can't guarantee that any performances will get any air time at the All-Star game. However, the Pistons drum line is guaranteed some air time at tonight's NBA All-Star celebrity game, on ESPN tonight at 6 p.m. Central time, Ohme says. The group will play intros to the three-point contest and the dunk contest.